Finished Sep 2017. Final score: 5 / 5. I enjoyed The Lunar Chronicles. Also, the description said this book was a standalone novel. I bought this book purely on the strength of The Lunar Chronicles. 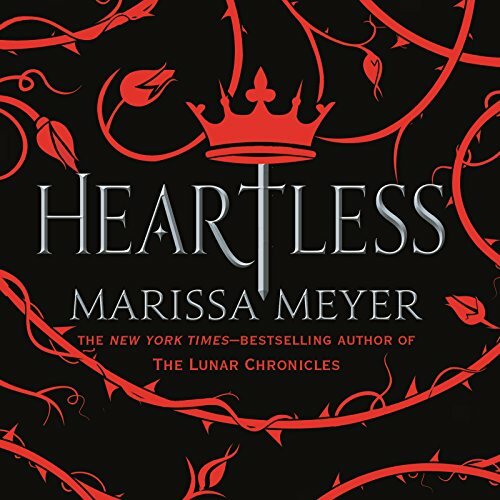 This is the 7th book from Marissa Meyer I will have read. If you liked any of the Lunar Chronicles books (Cinder, etc), you will enjoy this book. That was quite an ending. I was about to be annoyed because I was promised a standalone book. I thought it was going to leave me hanging because there was no possible way this book can end with so few pages left. Yet, somehow, everything was wrapped up nice and neat. This is my 7th Marissa Meyer book. I've read each of them in the order she has written them, and I've gotten enjoyment seeing her writing skill evolve. She has gone from skilled with Cinder, to now amazing (Winter and Heartless). Every piece of the book was laid down with a purpose (think of Chekhov's gun, for you literary types). There is just enough detail I never get bored. There is substantial main character growth, and the growth happens at a compelling rate. The dialog is good. The book is basically 2 parts. The first is gathering up all the characters. The second is the journey in to Wonderland. I enjoyed the first part a lot more than the second. Part 2, though well-written, just was not quite as entertaining, and the foreshadowing felt a bit forced. The ending made up for it though. If Marissa Meyer writes another standalone, I will buy it. The Renegades series is still unfinished, so I am avoiding it. I hope I don't have to wait 3 years for it. Discuss Heartless in the forums.